From the 1982 season onwards, the European Touring Car Championship was run under the new Group A regulations. The homologation requirements stipulated that at least 5,000 examples needed to produced in a single year. Taking no chances, BMW opted to submit the 5-Series for homologation instead of the 635 CSi previously used. Together with specialists Eggenberger, BMW developed a kit for customers to convert the 528i into a Group A racer. TWR's Tom Walkinshaw, however, was not one for the conservative approach and had managed to homologate the V12-engined XJ-S Coupe as a Group A Touring Car. While it perhaps not complied with the spirits of the regulations, protests from rival manufacturers had no effect. Fortunately, the XJ-S was not quite as reliable as it was fast, which allowed the dependable BMW 528i to shine. BMW Italia drivers Umberto Grano and Helmut Kelleners were crowned champions in 1982. 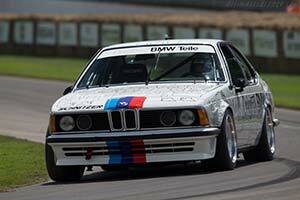 Taking TWR's lead, BMW scrambled to sanction a Group A version of the latest 635 CSi for the 1983 season. The new racing car was a joint production by BMW specialists Alpina, who supplied the modified six cylinder engine and Schnitzer Motorsport, who were responsible for final assembly. The straight six was tuned to produce around 290 bhp and the interior of the luxury coupe was stripped to reduce weight. It was also fitted with the widest wheels and tyres permitted by the regulations.